The Department of Natural Resources reminds everyone that after the heavy ice and snow cover melts on Michigan's lakes in early spring, it may be common to discover dead fish or other aquatic creatures. This year’s severe winter, with heavy snow and ice cover, will create conditions that cause fish and other creatures such as turtles, frogs, toads and crayfish to die. 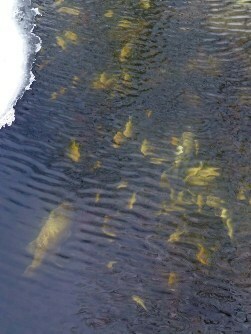 "Winterkill is the most common type of fish kill," said Gary Whelan, DNR fish production manager. "Given the harsh conditions this winter with thick ice and deep snow cover, it will be particularly common in shallow lakes and streams and ponds. These kills are localized and typically do not affect the overall health of the fish populations or fishing quality." Winterkill occurs during especially long, harsh winters – similar to the one experienced this year. Shallow lakes with excess aquatic vegetation and soft bottoms are particularly prone to this problem. Fish and other aquatic life typically die in late winter, but may not be noticed until a month after the ice leaves the lake because the dead fish and other aquatic life are temporarily preserved by the cold water. "Winterkill begins with distressed fish gasping for air at holes in the ice and often ends with large numbers of dead fish that bloat as the water warms in early spring," Whelan explained. "Dead fish and other aquatic life may appear fuzzy because of secondary infection by fungus, but the fungus was not the cause of death. The fish actually suffocated from a lack of dissolved oxygen from decaying plants and other dead aquatic animals under the ice." Dissolved oxygen is required by fish and all other forms of aquatic life. Once the daylight is greatly reduced by thick ice and deep snow cover, aquatic plants stop producing oxygen and many die. The bacteria that decompose organic materials on the bottom of the lake use the remaining oxygen in the water. Once the oxygen is reduced other aquatic animals die and start decomposing, the rate that oxygen is used for decomposition is additionally increased and dissolved oxygen levels in the water decrease even more leading to increasing winterkill. For more information on fish kills in Michigan, visit www.michigan.gov/fishing. If you suspect a fish kill is caused by non-natural causes, please call the nearest DNR office or Michigan's Pollution Emergency Alert System at 1-800-292-4706.